Set phasers to AWESOME because you can play this on your iPhone. 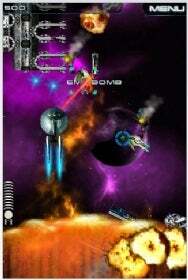 Electronic Arts (EA) on Thursday announced the release of the Star Trek game for the iPhone and iPod touch. It’s available from the App Store for $5. Just in time for the premier of the new motion picture that “reboots” the legendary science fiction franchise with a new cast reprising the roles of “Classic” Trek characters Kirk, Spock, Scotty, Sulu, Uhura and Chekov, the Star Trek iPhone game lets you pilot the U.S.S. Enterprise on a mission to seek out and … destroy your enemies. Spock and Kirk make appearances as you journey through space and time, battling ships from alien races including the Klingons, the Romulans and the Cardassians. You will battle Khotak elite fighters, the Bird of Prey and Vor’cha Battle Cruiser, listen to music from the original Star Trek soundtrack, and more. Star Trek: The Mobile Game requires iPhone 2.2.1 software update or later.